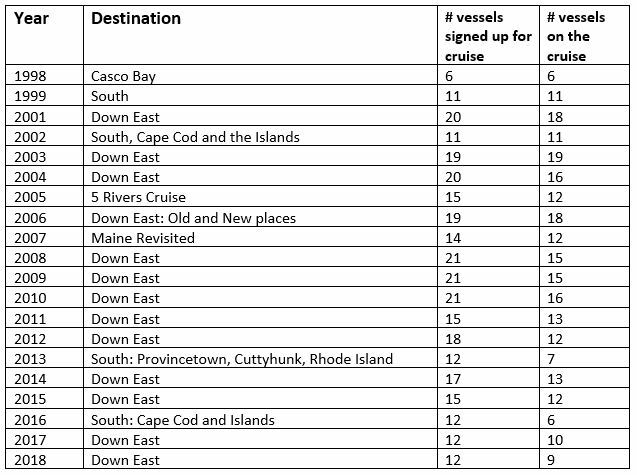 Look for Cruise information to come for the 2019 boating season! 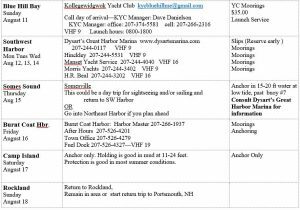 The 2018 PYC Cruise travelled Down East this year. The PYC Cruise began with a kick off cocktail party in Rockland at Journeys End on August 5th and ended in Camden on August 19th. A total of 26 attended the kickoff party for the Cruise on Sunday August 5th. It was hosted by Ken Kew, Bob Marsh and Gail and Eric Spivey and held on the docks at Journeys End Marina. Dan and Phyllis Gingras & Merle Kew joined us which was great. 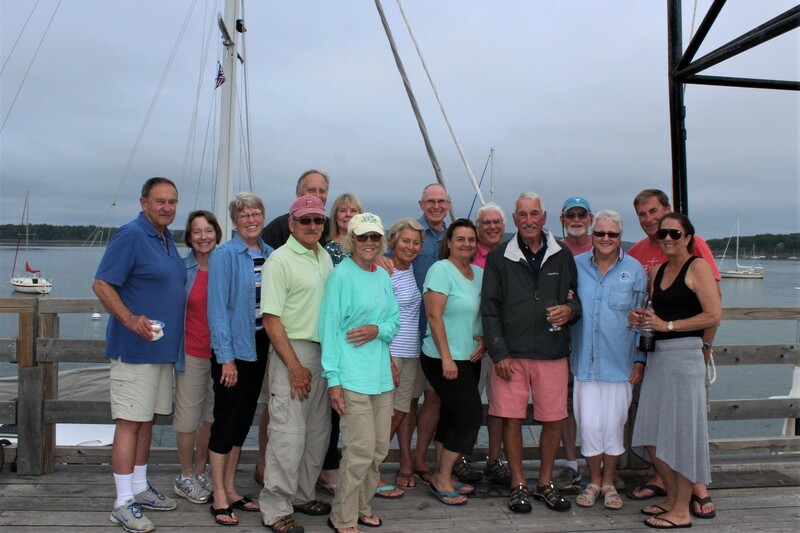 Also, some good friends from the old Pepperell Cove Yacht Club including PCYC founder and Rockport Maine resident, Bill Leone and his wife Gretchen, as well as Wendy Keller and her husband Bob Martin, joined us at the party. Our first port was Camp Island, where 16 of us enjoyed pot luck appetizers on shore. From there we travelled to Lunt Harbor, where we enjoyed a lobster dinner on the dock. The next day we headed for Western Way and Southwest Harbor. Most of us stayed at Great Harbor Marina for 3 nights. Olive Oyl anchored close by. Jane and Mika, the managers at Great Harbor Marina, are always very accommodating. We pre-arrange with them to use the “all weather” deck. The first evening a cocktail hour on the marina deck was hosted by Pat Daly and Roy Briscoe. On the second evening, a cocktail hour was hosted by Janice and Rick Buy. 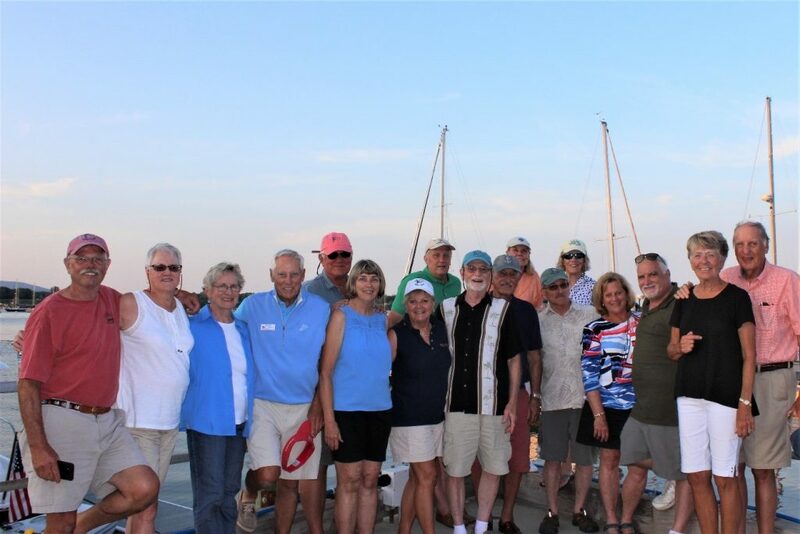 Following cocktails, Carole and Cody Cartnick and Jay and Sherle Edwards provided a chili and cornbread dinner as well as dessert for the cruising group. It was great to have Pepper Sinkler join us in Southwest Harbor. Some went to Somes Sound, some took a ferry ride to Little Cranberry Island- both excellent. On Saturday, August 11th, we headed for Pretty Marsh. 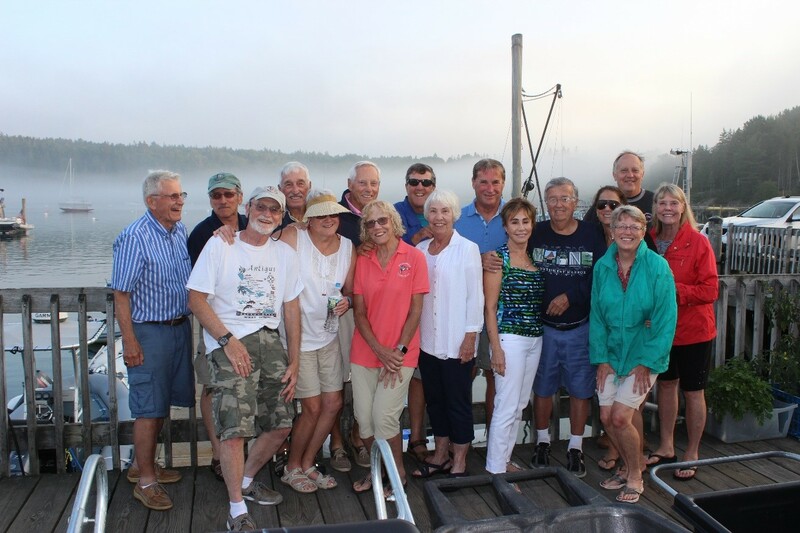 We planned a dinner menu for that night – everyone brought a portion of the meal and 9 of us thoroughly enjoyed our dinner on Rock a Buy, Rick and Janice Buy’s Sabreline power boat. 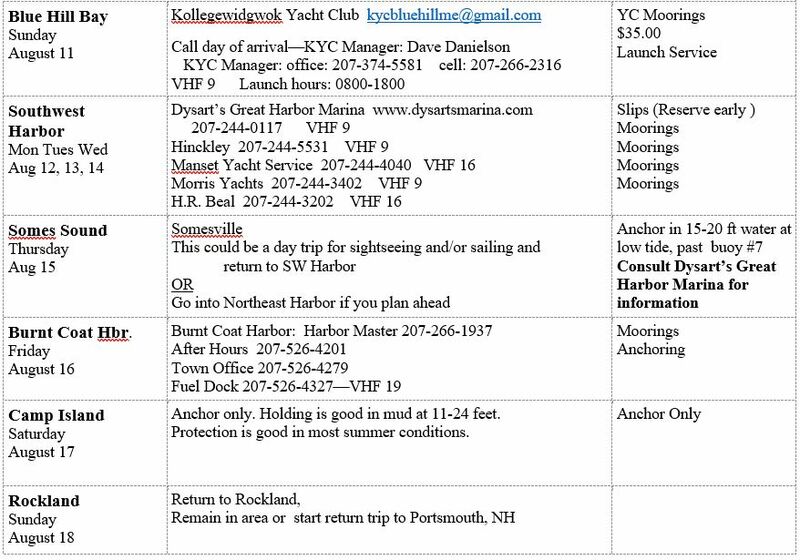 PYC Cruisers spent a quiet Sunday in Bucks Harbor. 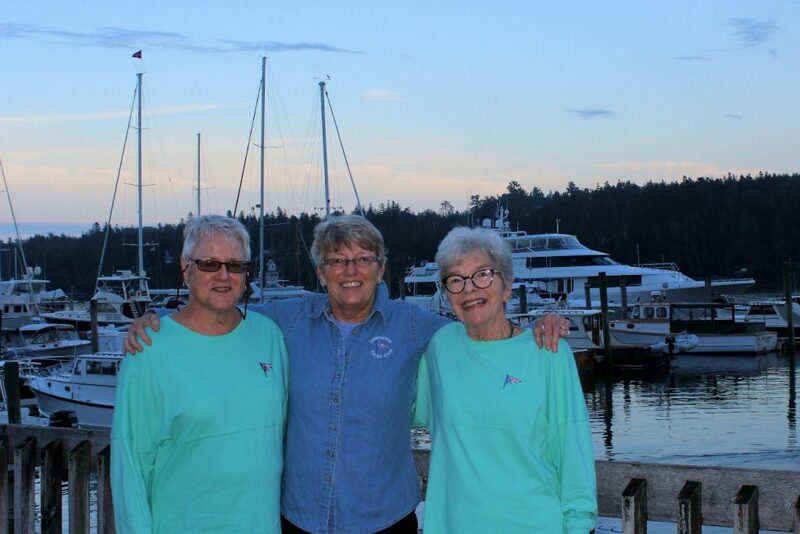 In Castine, two couples cruised in their land vehicles to join in: George and Nancy Kinser and David and Nancy McArdle hosted a cocktail party on the dock at Eaton’s Boat Yard. Chris and Whit Weller also joined us in Castine on their sailboat, Reliance. Following the cocktail party, Eaton’s Boat Yard (Suzanne and her father Kenny) cooked lobsters for the PYC Cruise group, which everyone enjoyed. We left Castine in dense fog on Wednesday August 15th, but soon the weather improved to sunshine and blue skies and we had an enjoyable trip to Belfast. In Belfast, we spent time chatting on the docks, walking to town and shopping. Twelve of us which included the McArdles, went to dinner at Delvino’s on Wednesday night. The following night we went to Ondine for a happy hour of oysters and wine before dinner. On Friday we travelled to Cradle Cove on Islesboro Island. We had a get together on the deck at Dark Harbor Boat Yard. Bob and Jan Bagshaw were vacationing on Islesboro with their family. They and their 3 adult children and daughter in law came to join us in Cradle Cove on their boat, Cast Off. There were 14 of us. Camden was the last port on our cruise. The ladies went shopping while there, and the men went out to lunch… At this point our fleet was now three boats – the six of us enjoyed our time while there. All in all, the group enjoyed a great trip Down East, with great weather and great camaraderie. It was great that many members joined in the Cruise this year by sea and by land. It is a great time with a fun group — we invite you to consider joining all or part of the PYC Cruise next summer!